Open or Proprietary Green Standards? "The fact that green building codification has been left to mature with private sector advocates testifies to a failure of public leadership. If governments now simply nod toward one of the existing rating systems in toto and say, “Me too,” they will create some shiny golden apples for the chosen system. Governments will better serve the cause of green building if they develop a set of prescriptive standards that act impartially toward existing private rating systems, freeing private-sector advocates to complement one another’s efforts in pushing the green frontier." Full Article on GreenSource. California has taken leadership in this regard by publishing CalGreen, the state's mandatory green code. But CalGreen, like LEED, is an additional layer of regulation that makes up for failures in the IAPMO and ICC model plumbing-, mechanical-, and building-codes. California's CalGreen perpetuates a double-standard in building regulations by having three tiers of requirements. The bigger cities are enforcing the upper tiers, making LEED-equivalent the worst-allowable construction. Smaller jurisdictions may require a weak local Green Building Regulation as an alternate to CalGreen. "Greater return on investment in insulation will be found by focusing on refurbishment of existing, poorly-performing homes than on increases in new build regulation." From the 2007 thesis "What are the Financial- and Carbon-optimal Points for Return on Investment inInsulation?" by Jamie Bull, University of East London. The work "examines whether it is worthwhile to continue lowering the elemental U-values demanded by Building Regulations in light of the diminishing returns found when increasing insulation thickness.... Key results are that the carbon-optimal point is far beyond the financial-optimal point for all materials assessed. The carbon-optimal point is also beyond the requirements of Building Regulations. However the financially-optimal point (before accounting for co-benefits) is below Building Regulations. Therefore it is found that, at the margins, super-insulation is an expensive way of reducing lifetime CO2 emissions." 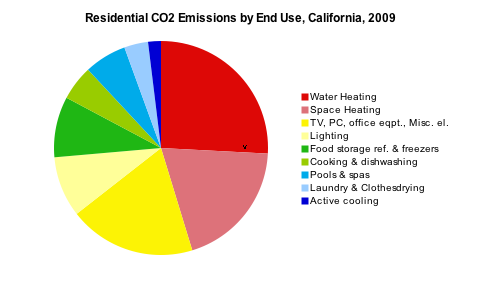 Here is a chart that breaks down California residential CO2 emissions into end-uses. The data comes from the 2009 CALIFORNIA RESIDENTIAL APPLIANCE SATURATION STUDY Executive Summary. 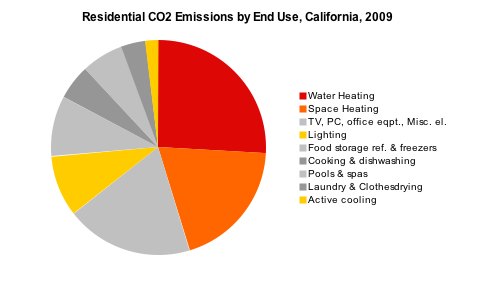 Space heating and water heating account for nearly 50% of all CO2 emissions from residential building stock. The energy source for these is mostly natural gas. Compared to electricity, this fuel is cheap per pound of CO2 generated. This makes it hard to argue for CO2 reductions on the basis of energy cost savings. Here is the same chart, re-colored to highlight the end-uses that building designers can affect. These end-uses may persist for the life-of-structure: for example, it's costly to change a building's orientation or significantly increase its insulation levels. This second chart shows that resident choices and behavior (shown in gray) may account for 40% of a building's metered energy consumption. The other 60% (shown in color) may be due to choices made by the designer and equipment specifier. Designing to Passive House standards can cut out most of the active heating and cooling energy. Solar water heating can cut out most of the Water Heating category. Daylighting can halve the Lighting category, with low-power electric lights knocking out much of the remainder. The fun challenge is to implement these concepts cost-effectively, especially for existing buildings, in today's contracting economy. "...one crucial approach to energy consumption in 2041 will surely be efficiency at levels unimaginable today: the ability to achieve maximum economic output for minimum energy input. The lead players three decades from now may be the countries and corporations that have mastered the art of producing the most with the least. Innovations in transportation, building and product design, heating and cooling, and production techniques will all play a role in creating an energy-efficient world."